Good Evening friends! Can you believe it? Two days, two posts. Whaaaaaatttt? I hope that you are all doing well, enjoying summertime, soaking up the sun as Sheryl Crow would say. I had the pleasure of attending my niece Cynthia's college graduation party and my nephew Trevor's high school graduation on the same night. The meat my sister served, shredded and with choices of sauces, was out of this world. No, I am serious, it was unlike any other I have ever eaten. When I asked her how she seasoned it, she said she used Jim Baldridge's Secret Seasoning. Wowzer. I immediately knew I wanted to try this, and I wanted to make a french dip out of the meat I seasoned with this seasoning. This is a Nebraska based company, so I am completely unsure if you can buy it in any other states other than their website Jim Baldridge's Secret Seasoning. It is an MSG, gluten and allergen free seasoning. The flavor is that of a smokey, oh I don't know, I can't explain it, it is just that good. This is less of a recipe and more of a method. You can use any roast you like, you can even put it in the crock pot. Yes, I said it, CROCK POT. A fattier roast will do better, especially if you want to shred. I wanted to thin slice so I chose one that has virtually no fat. I used a very lean roast, that would only get tougher the longer I cooked it but I knew I wanted to slice it for french dips ahead of time so I didn't worry that it had no fat. Here is how I used the seasoning. I took 2 eye of round roasts, smallish, probably 2-3 lbs in total. I used 1/4 cup of seasoning, and patted it into the roasts and put them in a Ziploc and let them marinate in it overnight. Actually it was a full 24 hours. At that time, I took another 1/8-1/4 cup and massaged more into the meat. Yes kids, I massaged it good! I then put it into a slow cooker liner bag. I added 1 cup of water and 1 beef bouillon cube. Tie that puppy up, tight! Now you are going to proceed to wrap it in 3-5 layers of foil. Now, put it in a 9x13 pan, and cook it on 200 degree's, for about 5-7 hours. You can go 300 for 3-4 hours. You can also put it in your crock pot, on low for about 10-12 hours. If you put it in the crock pot you obviously will not be able to slice it, you will need to do shredded beef sandwiches. You can serve with BBQ sauce or whatever you choose. Admittedly, I need nothing, the flavor is awesome all alone. Now heat up that consume`, and add some juice from the bag your meat was in! You can add a drop of Worcestershire sauce if you like too! 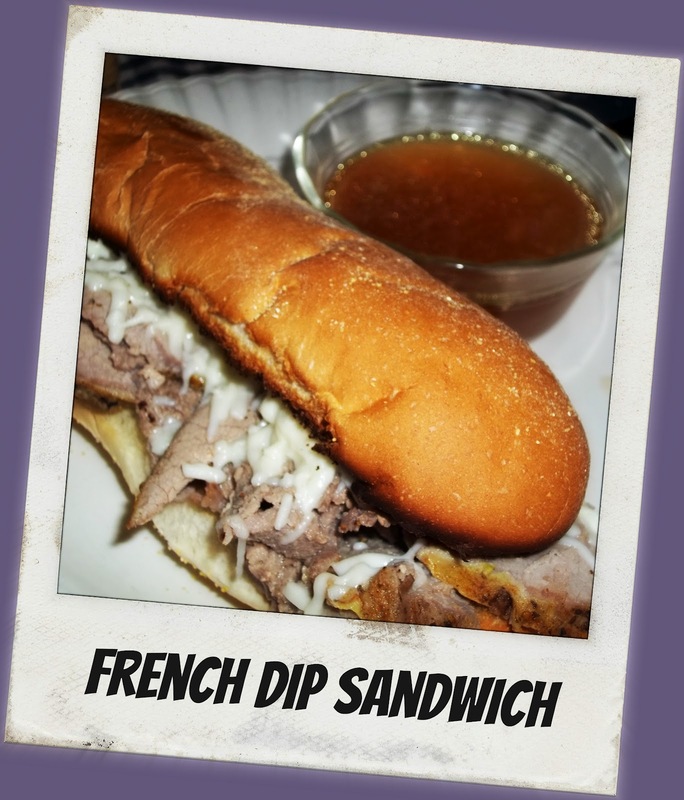 Makes amazing Au Jus! Lucky for us, the fine folks at Jim Baldridge's Secret Seasonings have sent me a couple of bottles of their awesome spice to share with my readers. So leave a comment below and it will be your entry to win. There will be 2 winners chosen by random.org. Please, only one entry per person. You have until June 20th (8pm CST)!! Please enjoy these sandwiches, you can have cheese or no cheese! Slice your meat THIN! Toast your rolls they are SO much better that way! Looks good, girl! I'll have to look out for that seasoning! I use my crock pot all the time! Meat always comes out tender coking this way! Enjoy! I will be on the lookout too! 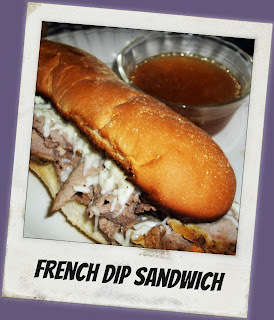 I love French Dip Sandwiches. Nice sandwiches - sounds delicious. It's almost 1 am and after reading this recipe, I am now starving...what's a girl to do? I see this rub down happening on a fat, juicy pork shoulder... OH YEAH Baby! This would be great on a pork shoulder then in the smoker! Looks amazing and love different spices and spice mixes...so many things I could do with these spices!!! Sounds D I V I N E!!! Come on Jim Baldridge...come see Mama in Slapout, Alabama!!! I love using my crock pot and trying new things. Hello TerriBeth! If you scroll down the page, on the right hand column, just under the "foodista" badge, you will see, "follow by email". Enter your email address in and WAAA-LLAAA! Thanks for your kind comments and I am so glad you enjoy it!